Thanks, "Hand Model Jonnie," for helping me with this shot. (I think it's time to go shopping for some food-styling props.) I could have called these "Oh My God" cookies because that's what Jon said when he had his first bite: "Oh my god these are good." Ah...the words every baker lives for. Thanks also to my reader Alicia, whose email about coconut-stuffed brownies inspired this recipe. An image of a German chocolate cake (GCC) popped into my head as I read her message, and then I got the idea to make a GCC cookie. I first pictured it being a stuffed cookie, but I think it's really more of an inside-out cookie. What could be better than a super-fudgy chocolate cake wrapped around a center of sugary coconut frosting? Well duh...a bite-sized version. As I said in my posting for the Peanut Butter Cup cookies, I've come up with the best chocolate cookie base. Ever. In fact, I used that chocolate cookie dough recipe for these guys. You've got to try this dough. I did some research on the GCC coconut frosting and found that it usually has a lot of eggs and sugar in addition to some pretty rich and sweet ingredients like sweetened condensed milk, coconut, and butter. 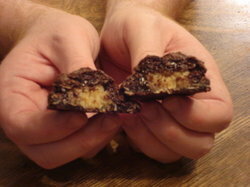 The chocolate "shell" of these cookies is already rich and delicious, so I didn't want the filling to be too sweet or too dense. My frosting/filling sticks to the basics and is the perfect complement to the chocolate. Go here for step-by-step stuffing instructions. Makes about three dozen cookies. Add the filling ingredients to a medium-sized nonstick pan and simmer over medium heat, stirring often, until the coconut starts to brown. Once the filling mixture is a toasty brown color (about 10 minutes), remove from heat. Let the mixture cool and hold in the refrigerator until step 8. Remove the filling mixture from the refrigerator and stuff each dough ball with 1 teaspoon of the mixture. Put the stuffed dough balls in the freezer for five minutes to firm up. I think you've out-done yourself with these cookies - even though I haven't even tasted them! My mouth is watering just by looking at the picture and reading the recipe. These are a "must-try" for sure. I love you're creative and simple presentations in the photos. Of course, this hand model is my favorite! Hi! I just made these cookies and they are DELICIOUS! I made a few adjustments (I always do when I'm cooking or baking) I didn't have any unsweetened chocolate or milk chocolate, so I ground up some butterscotch and semi sweet choco chips. I also added a dash of cinnamon and a dash (like pinch, really) of ground coffee. They are so good. But I think I may have cooked them too long. They don't really turn golden brown since they're already so dark. They are a tad dry, so I dropped the cooking time down to 9 minutes (but my cookies got progressively smaller too, once I realized that I wanted to share them with a bunch of people). All in all, a fabulous recipe and I can't wait to make another! And now I'm going to go to the post office to send some to my sister and real life recipe user Em, who frequents your blog often!